With an average of 34 deaths a year, or 0.69 fatalities per million skiers/snowboarders, downhill/alpine skiing is a very safe sport, providing you have the proper training and equipment, according to Dupont Emergency Response Solutions. Do not try to ski yourself into shape - it won't work. In order to get maximum enjoyment out of the sport, you have to be in shape, as skiing puts a lot of strain on the hips and thigh muscles as well as the knees, ankles and abdominal area. When it comes to downhill/alpine skiing, the most common injuries are ligament sprains, soft tissue bruising and joint injuries - in that order. The single most common injury is a grade 1 to 2 sprain of the medial collateral ligament (MCL), which is located on the inside of the knee. "This occurs when the lower leg twists outward, relative to the thigh and the MCL takes the strain," reports ski-injury.com. Other causes of MCL injuries include failure of the ski binding to release, as well as snowploughing gone wrong - especially when the skier uses a wide and unstable stance. Before you get anywhere near a slope, you have to get kitted out with the proper gear from head to toe. Whether you buy or rent equipment, ensure the ski shop has knowledgeable staff. Binding fit is extremely important. Properly adjusted bindings are based on your height, weight and level of expertise. The ski shop staff must know these things and it is important for the skier to not lie about any of it, no matter how much you may want to hide those extra 20 lbs or think you are an expert skier - on the bunny hills. Properly fitted bindings and boots will go a long way towards reducing your injury rate or its severity. "A bad boot fit usually results in the skier unbuckling the boot, to some degree, in order to ski without pain," according to the Center for Knee, Shoulder and Hips. "This response can result in a dramatic reduction in your ability to control your skis, which increases the possibility for accidents." Therefore, if it doesn't fit in the shop, it won't fit on the slopes. When choosing that ski-bunny outfit, ensure the fabric is water and wind resistant; has wind flaps over the zippers; has snug wrist and ankle cuffs; as well as collars that can be tied tight against the chin to help keep the wind out. Dress in layers, wear gloves or mittens and a headband or hat - approximately 60 per cent of a body's heat loss is through the head. Don't forget the goggles - they improve visibility by reducing glare and wind, as well as protect your eyes from projectile debris and snow. They also protect your eyes against UV rays. Sunscreen is also needed to protect your face from the UV rays. There are currently no laws requiring skiers to wear helmets and opinions are mixed, however, when it comes to children, helmets have shown to reduce head injury severity. If you are getting a helmet for yourself or a child, ensure it is certified for snow sports - look for the ASTM F2040, Snell RS-98 or CEN 1077 standards, according to the Children's Hospital and regional Medical Center in Seattle, Washington. The helmet pads should fit flush against the cheeks and forehead. The back of the helmet should not touch the nape of the neck. The helmet should be snug with the chinstrap fastened, fit above the eyebrows and not slide foreword or backwards. Studies have shown that taking lessons helps reduce injuries. But don't take lessons from family and friends - get them from a certified instructor. Your instructor will not only help accelerate your skill level, he/she will also let you know which trails you are most suited for. It is important to know your capabilities and remain within them. Green Circle - easiest trails, are generally wide, groomed and have a gentle slope. Good for beginners. Blue square - intermediate level; steeper than beginner trails, yet easy enough for intermediate skiers. Not extremely steep. Gently groomed and may have easy moguls or very easy glades. Black Diamond - difficult trails for advanced skiers. 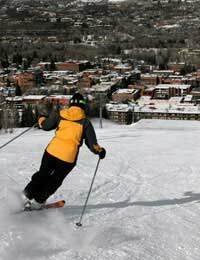 They can be steep, narrow or ungroomed as well as have icy conditions. Will have moguls and glades. Doubled Black Diamond - extremely difficult and for experts only. Extremely steep slope, difficult moguls, glades and/or drop offs. Learning when and how to fall, as well as knowing what to do after a fall, will go a long way towards avoiding serious knee injuries. Keep your body flexed; legs together; chin against your chest with arms up and forward. Be prepared to use your arms to protect your head. Do this by dropping your ski poles if they haven't already gone flying. "After the fall, if you don't stop immediately, get into a position which allows you to see where you are going," according to Vermont Ski Safety. "If you attempt to stop yourself by engaging your skis, resist the instinct to fully straighten your legs."